It’s like what JNF does with trees in the earth, but instead it’s coral underwater. It’s like what JNF does with trees in the earth, but instead it’s coral underwater. On a recent mission to Israel with JNF, a few lucky participants found themselves on a boat off of Eilat, engaged in a fun and fascinating project. 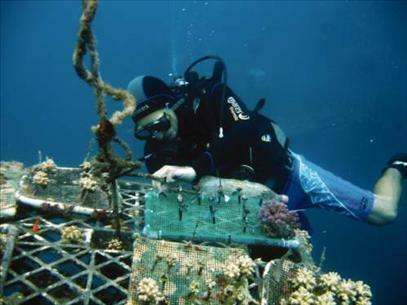 A JNF mission participant dives deep into the Red Sea to plant a coral nursery. After a brief lesson from marine biologists about the loss of coral reefs around the world, they super-glued little pieces of coral onto objects that resembled golf tees, loaded them onto a grid and floated them down into the Red Sea, where they were left to grow. The underwater equivalent of planting saplings in a forest, no drip irrigation required. Eilat’s small farm can grow between 6,000-10,000 corals; it takes about a year for them to mature enough to transplant. Over the past 20-30 years, coral reefs throughout the world have been degrading at an alarming rate. Enter the National Institute of Oceanography (NIO) in Haifa, Israel and the research of Dr. Baruch Rinkevich and Dr. Shai Shafir, to be funded in part by JNF. With the idea of actively restoring reefs as opposed to just conserving them, they built the first mid-water floating coral nursery in the world and are sharing the concept with other countries.